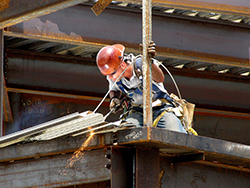 While most welders know to invest in high-quality masks and gloves, one commonly overlooked piece of gear is a pair of protective work boots. 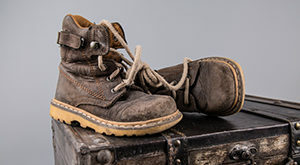 Whether you’re a professional welder or a weekend enthusiast, it’s important to find work boots that are specifically designed to prevent injuries caused by the hazards of the job. Welding is a particularly dangerous profession. You’re constantly exposed to extreme temperatures, molten metal, and flying sparks that can quickly burn up standard shoes. 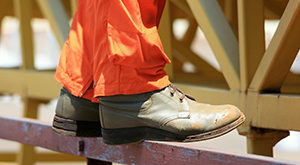 Work boots can help to keep you protected from these hazards. They’re an essential part of the uniform along with your mask. With that being said, standard work boots just won’t cut it. You need to look for unique safety features, resilient materials, and a durable design. On top of that, you’ll want to get boots that are comfortable and easy to work with. 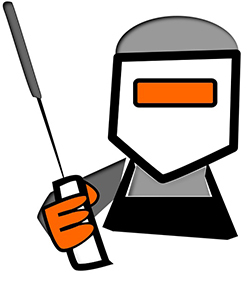 While it may seem like a tall order, there are a number of great options on the market targeted to welders. 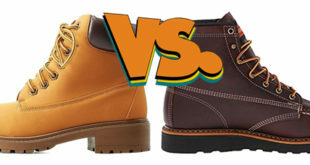 These boots from Timberland are designed to exceed ASTM safety standards. They’re lightweight and flexible but contain a number of safety features that are beneficial to welders. The boots are made from waterproof leather and have an antimicrobial lining for comfort. 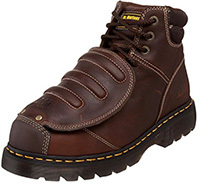 The most prominent feature of these boots is the hinged metatarsal guard. It covers the upper portion of the foot and stays secure via the laces. The guard not only protects your foot but also prevents the laces from catching fire. There are only 3 visible lace clips on either side of the foot to secure the boots at the ankle. The open loops make it possible to slip the laces off and remove the boots in case of an emergency. 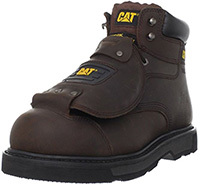 The Assault boots from Caterpillar are a classic example of solid work boots built with protection in mind. They’re made from full grain leather for lasting protection and durability. The boots also have a single-stitch welt and thick rubber soles for comfort and stability. 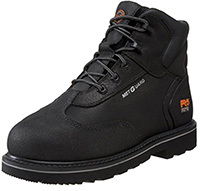 For protection in the workplace, the boots have a rounded steel toe cap and a sizable metatarsal guard. This guard keeps the top of your feet safe from crushing damage while making sure that sparks and hot material don’t damage the laces. The shaft rises 6 inches high and is topped off with a comfortable padded collar. With their full-grain leather construction and thick synthetic sole, these boots from Doc Martens are a great option for welders. The welt base construction makes them water resistant while the high-quality upper material is tough and resilient. The sole itself is made from PVC. 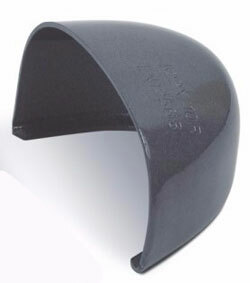 It’s heat-sealed and has a bottom tread designed for slip and oil resistance. The sole is also shock-resistant and impact-resistant. On top of the boots are large metatarsal guards. They cover most of the laces but can be lifted for easy access. The boots also have an ASTM-approved protective steel toe. Another great option from Timberland, these work boots are built to surpass ASTM safety standards while remaining sleek and comfortable. Instead of a bulky external metatarsal guard, these boots have one built in. It’s contoured to match the curves of your foot for maximum comfort and protection. There’s also a large 6-inch steel toe cap. The uppers of the boots are made from leather and utilize Kevlar stitching. The threads are self-extinguishing. 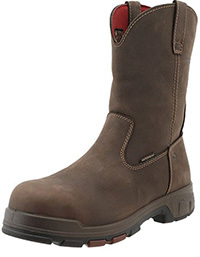 The boots also have a steel shank and open-cell polyurethane padding for support and comfort. The outsole is made from rubber and designed to be heat, oil, and slip resistant. These boots from Wolverine have a simple slip-on design. There’s no laces, buckles, or zippers to worry about. It has a relatively high shank that extends above the ankle, allowing you to minimize exposure of your leg to the high temperatures and hazards of welding. The uppers are made from leather. They’re bonded directly to the slip-resistant outsoles to create a seamless and protected transition. Inside, the boots have a dual-density foam footbed that’s designed to prevent fatigue. There’s also a tougher midsole and nylon shank for support. The footbed is completely removable for easy maintenance. 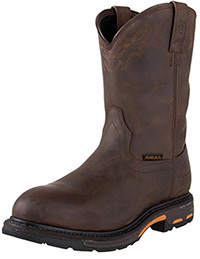 Made to keep you safe and comfortable in any condition, these boots from Ariat have a number of unique safety features. It has a wider shank and heel stabilizers to reduce fatigue. The footbed also has a design that improves overall torsional stability and places your foot in a healthy position. It’s also moisture-wicking and has an EVA midsole that absorbs shock. The uppers are made from leather while the outsoles are made from slip and oil-resistant rubber. To combine the two, the manufacturers used a single-stitch welt system. 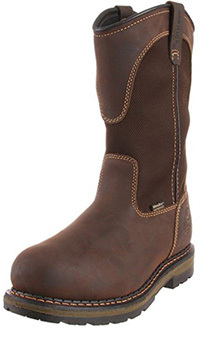 The boots are designed to slip on and have a shaft that measures 10 inches high from the arch. These long slip-on boots are made from a combination of full-grain leather and nylon. The shaft measures approximately 12 inches from the arch to provide you with high levels of coverage and protection. The outsole is secured with welt construction for strength and waterproofing. The outsole is made from rubber and is designed to be resistant to slips, oil, heat, and abrasion. 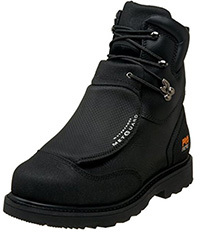 The boots also comply with ASTM electrical safety standards. The interior of the boots features a strong aluminum safety toe. There’s also a removable footbed and moisture-wicking lining to keep your feet dry all day long. 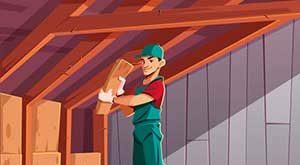 There are a number of things you should be looking for when shopping for work boots. 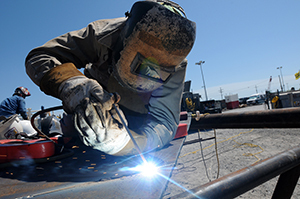 The best boots for welders have a number of built-in safety features to help keep you protected as you work. Understanding these features can give you a better idea of how a pair of boots will work for you and help you narrow down your choices. One of the biggest safety hazards you’re going to face when you weld is the extreme temperatures. Regardless of the type of welding you’re doing, you’re going to be dealing with something that can get several thousands of degrees hot. 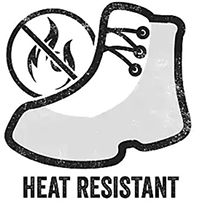 To avoid burns, you need to invest in boots made from a material that’s resistant to heat, such as leather. Leather provides you with the most protection. Other cheaper materials can shrink up and become deformed after a few minutes of exposure. However, leather will create an effective barrier between the welding torch and your foot. Furthermore, the material can keep you somewhat protected from sparks or molten metal. While it’s not impenetrable, it does take a few moments to burn, giving you time to take the boot off before the material has burned through the leather. In addition to choosing leather, you should pay attention to the construction of the boot. It’s recommended that you stay away from large tongues, eyelets, and any other crevice where molten metal can get stuck. Stick with boots that are relatively smooth to ensure that scorching hot material is capable of sliding off with ease. Furthermore, pay attention to the material and quality of the stitching. Stitches should be reinforced for durability and safety. They should also use threads made out of materials like Kevlar, which is naturally fire-resistant. Typically, lace-up boots will provide you with a more comfortable fit. You can easily manipulate the tightness at various points along your foot to ensure that the boot is secure. However, laces can be very dangerous when you’re welding. Not only do they make it difficult to remove your boots in a hurry, but the laces can catch fire from stray sparks. Your best bet is to get boots that have certain safety precautions built in. Many boots have a leather guard that goes over the laces. It protects them from sparks while not affecting the overall fit of your boots. Another option is to get boots that have a zipper or quick-release strap. When you put these boots on, you can use the laces to get a snug fit. Should an accident occur, the alternative closure method is there to help you remove your boots in an instant. Beyond the dangers of sparks and hot material, you should also stay protected from accidents involving equipment in your work environment. Heavy objects like welding carts, tanks, or the object you’re working on can cause significant harm should they fall or roll onto your feet. This is when having a safety toe and metatarsal guard come in handy. Safety toes can be made from a variety of materials and act as a durable shield. For welding, it’s good to go with a composite toe that doesn’t conduct electricity. The same goes for metatarsal guards, which extend over the top of your foot to prevent crushing injuries. Depending on the type of welding you’re doing, you may want to invest in boots that are shock-resistant. Your welding gear and any exposed wires can create a lethal shock. 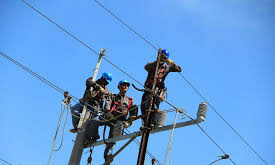 Many boots are made to protect you from electrical shocks up to 600 volts. They have a rubber non-conductive sole and composite safety features to ensure that your body stays grounded. What good is a pair of work boots if they’re a pain to wear? You should always look for comfort features that cater to your specific issues. Go with options that have heavy padding and a cushioned insole if you’re prone to foot fatigue. If you need a bit more support throughout the day, look for boots with a contoured footbed, a raised arch, and a solid shank to keep you stable. The key is to find boots that are built with both comfort and safety in mind to ensure that you won’t be feeling the effects of work after you get off. With the numerous options available on the market, you shouldn’t have any problems finding a pair of work boots that are catered to welders. It’s important to invest in boots that work with the unique challenges of the job to ensure that you always safe. With the right pair of boots, you can work safely and confidently.